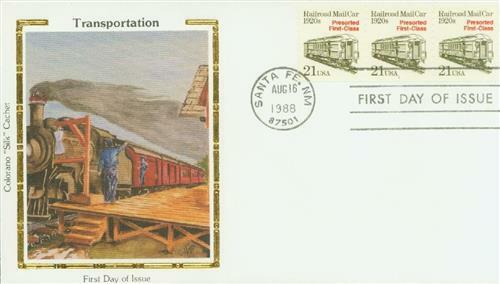 For nearly 30 years, trains were used to transport mail between post offices. The mailbags were loaded onto the trains and delivered to the post office where they were sorted. However, while some of the mail was delivered, many letters were returned to the bags and placed back on the trains to be sorted later. This inefficiency led American postal officials to consider other options. U.S. #Q3 pictures a railway postal clerk preparing to pick up and drop off mail at a station. Soon the idea emerged to have mail clerks on the trains to sort the mail as it traveled between towns. In 1862, the idea was briefly tested on the Hannibal and St. Joseph line in Missouri. Then two years later, Chicago’s assistant postmaster George B. Armstrong pushed for the widespread used of a railway post office and succeeded. The first mail car, a renovated baggage car, ran on the Chicago and North Western Railroad line between Chicago and Clinton, Iowa, on August 28, 1864. U.S. #Q5 pictures a mail train along with the crane holding mail to be picked up. Clerks aboard the train sorted mail not just for routes along the line, but also for those beyond the end of the line. This new railway mail service proved a great success. More mail cars were added to travel between New York and Washington, New York and Erie, Pennsylvania, as well as between Chicago and Burlington, Illinois, and Chicago and Rock Island, Illinois. 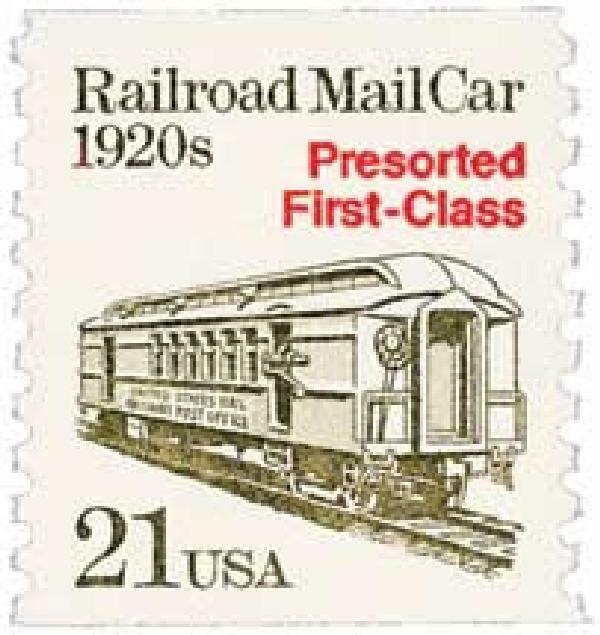 U.S. #2779-82 pictures U.S. mail milestones, including a railway mail car. These trains didn’t always stop at every station, but those smaller stations still had mail. Early on, the trains had to slow down immensely so the clerks could grab the mailbags, which was both inefficient and dangerous. Eventually, they developed mail cranes. Mailbags were hung on a crane at stations that were too small for the train to stop. The clerk grabbed the bag as the train passed at about 70 miles per hour. 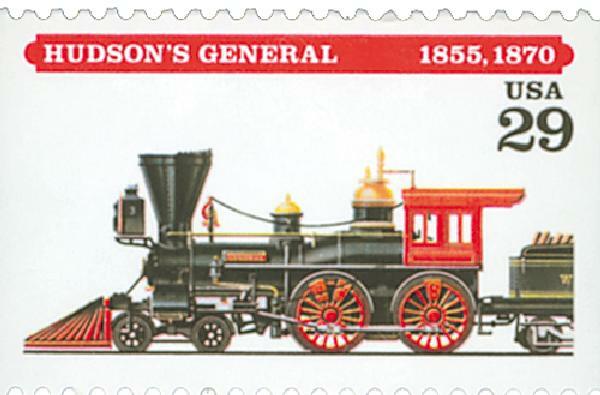 U.S. #2843 – Hudson’s General carried an East Division Railway Post Office. By 1867, there were 18 railway mail routes that crossed over 4,435 miles of track with 160 clerks hard at work. They were so efficient that dozens of clerks at stationary post offices were fired or moved to other jobs because they were no longer needed to sort the mail. The clerks took great pride in their work and could sort up to 600 pieces of mail an hour, and up until mid-1900’s, Railway Mail Service dominated the movement of the mail. U.S. #2265 FDC – Mail Car Silk Cachet First Day Cover. However, as airplanes and highways expanded and improved, the need for railway mail began to decline. Postal officials also began to move toward mechanical processing. On June 30, 1977, the very last railway mail car ended its final run when it pulled into Washington’s Union Station. Click here for a neat video, first-hand stories, and more about the Railway Post Office. 13 Responses to "This Day in History… August 28, 1864"
Actually, the clerk didn’t grab the mail bag from the crane as the train sped by. 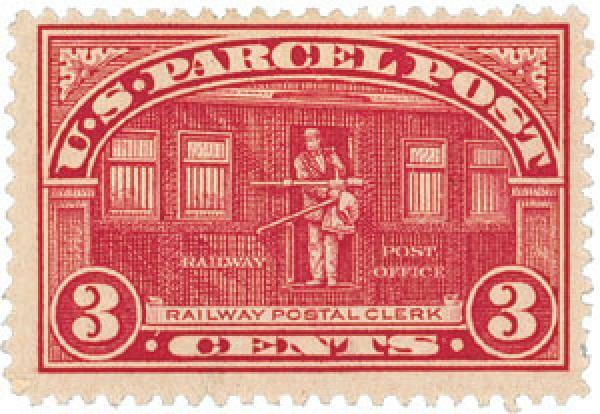 The triangular bars shown on the rail car stamp would be swung out by the clerk, and that bar would grab the bag, and the clerk would then swing the bar back into the mail car and take the bag off the bar. At the same time he would have thrown a bag onto the station platform (or close by if he didn’t time it just right) with the mail for that town. A most efficient system that lasted for 100 years. There were also similar mail-sorting buses for many places without rail connections. Now every night FedEx under contract from the Post Office distributes the already sorted mail bags to the majority of the nation’s cities. Trucks, many under contract, connect to the the in-between locations. But the romance of the trains is a wonderful memory. May I ask what your occupation (if any) is? I’m curious because you provided excellent information in your comment. 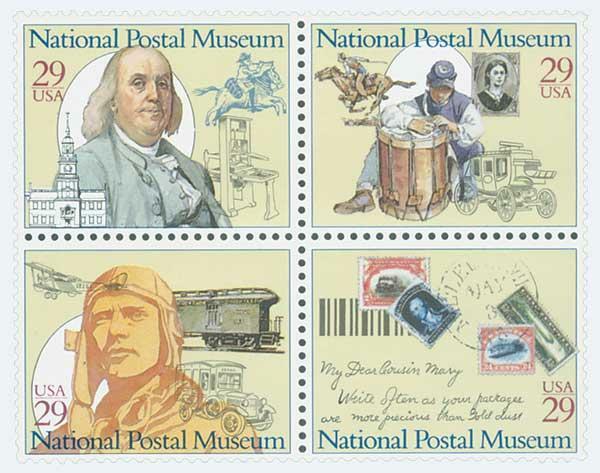 I was a Docent at the Smithsonian for 25 years, the last 10 at the National Postal Museum in Washington. There is an actual railway car in the Museum, as well as a stagecoach , and also 3 airmail planes hanging from the ceiling among exhibits.. There is also a fabulous newly opened stamp gallery. Don’t miss it if you visit Washington. Thank you Loren. The triangualr bar exchange answered the question I had as to clerks grabbing bags hanging from a crane as the train passed by at around 70 mph. Yes, it was easy to pick up on that error; there would have been a lot of broken arms! Ah the ‘romance of the rails’ was well-served by the mail cars, and I can remember the ubiquitous baggage carts at the station, laden with the canvas mail bags, waiting to be loaded on the next train. Not to mention the oft-realized feat of mailing from Syracuse in the morning and delivery in Buffalo in the afternoon delivery! 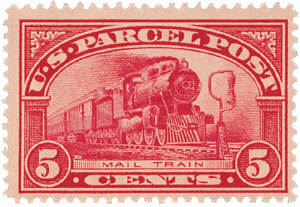 Those stamps pictured, along with other U.S., are in my railroad topical collection. again, very interesting. Keep it up. We used to sit out on the benches at the Railroad Depot in our small town of maybe 600 counting the farmers, and watch the bag disappear from the mail hook. It was something we did as kids to wile away the hours in our little Southern town. It was so exciting back in those days. I enjoy reading your synopsis on each stamp, thank you for sharing. Do you mean Burlington, Iowa, instead of Burlington, Illinois? I am pretty sure that the CB& Q railroads stood for Chicago, Burlington, Iowa, and Quincy, Illinois. I really enjoy the learning from this site! For Audre: The USPS did bring back six old stamps from the 1861 issue, at the NY2016 World Stamp Show in New York. I don’t happen to have access to mine at the moment, but you should be able to find them in the 2017 or 2018 Scott catalog, either Vol.1 or the US Specialized. Several old US stamps have been reissued in recent years: The 1847 5¢ and 10¢ in 1947 and again in 1997; The entire Columbians in 1992; the Trans-Mississippis in 1998; the Pan Am inverts in 2001; and the $1, $2, and $5 from the 1922 regular issue in 2006. Most have been issued in connection with a large stamp show. I tried to get the postal service to reissue the 1912-15 Panama-Pacific issue for the Exposition’s 100th anniversary in 2015, which was the theme of Westpex that year, but they declined. I, too, like seeing old stamps come alive again, and try to make a showpiece of them in my own collection. https://en.wikipedia.org/wiki/Owney_(dog) as save the railroad mail robberies.